The New England Patriots were coming off of a championship in 2003, and two in a three-year period, as they entered the 2004 NFL season. It was more of the same as Head Coach Bill Belichick’s team again went 14-2 and defeated the Colts and Steelers to advance to the Super Bowl. Ever-improving QB Tom Brady was joined in the backfield by eighth-year veteran RB Corey Dillon, who rushed for 1635 yards. WR Deion Branch (pictured at right) missed several games due to injury but was back healthy in the playoffs. The tough and savvy defense was anchored by DE Richard Seymour, linebackers Mike Vrabel and Tedy Bruschi, and SS Rodney Harrison. Their opponents in the Super Bowl on February 6, 2005 were the Philadelphia Eagles. The Eagles, in their sixth year under Head Coach Andy Reid, had finally broken through after losing three straight NFC title games. A fundamentally sound club on both sides of the ball, the Eagles had made major free agent signings in bringing in WR Terrell Owens and DE Jevon Kearse. QB Donovan McNabb had his best year as he passed for 3875 yards and 31 touchdowns. Owens contributed 77 catches for 1200 yards and 14 TDs before going down with a major ankle injury – he was back in action for the Super Bowl after a seven-week layoff with a metal plate and two screws in his right ankle. RB Brian Westbrook was an outstanding all-purpose back. Defensive coordinator Jim Johnson employed an attacking, blitz-heavy scheme that benefited from the addition of Kearse and included Pro Bowlers in MLB Jeremiah Trotter, CB Lito Sheppard, SS Michael Lewis, and FS Brian Dawkins. The Eagles went 13-3 in topping the NFC East and had gotten by the Vikings in the Divisional round of the playoffs and Falcons for the conference title. They came into the Super Bowl as seven-point underdogs against the defending champs. There were 78,125 fans in attendance at Alltel Stadium in Jacksonville, plus a huge television viewing audience. The teams traded punts until midway through the first quarter when the Eagles finally put a solid drive together. 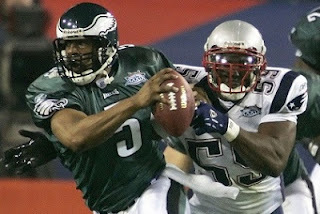 In a third-and-seven situation at the New England 47, McNabb threw to Owens on a crossing pattern that picked up 30 yards and a roughing penalty added an additional nine yards. However, a sack of McNabb by Mike Vrabel cost Philadelphia 16 yards. McNabb’s poorly-thrown pass into the end zone was then intercepted by CB Asante Samuel, but the Eagles got a break when LB Roman Phifer was penalized for illegal contact. But McNabb followed up with another bad pass that was picked off by Rodney Harrison, and this time the play stood. The Patriots were unable to move on offense and punted with the Eagles getting the ball back in good field position at the New England 45. Once again they turned the ball over when, three plays later, TE L.J. Smith fumbled after being hit by CB Randall Gay and Samuel recovered for the Patriots. Again the Philadelphia defense held and, with the scoreless game now early in the second quarter, the Eagles got the ball back at their 19. This time they went 81 yards in nine plays highlighted by McNabb completions to WR Todd Pinkston (pictured at left) that covered 17 and 40 yards. On a third-and-six play, McNabb threw to Smith for a touchdown. The Patriots came alive on offense, spurred by Brady passes to Corey Dillon for 13 and 16 yards to start off the next series. They advanced deep into Philadelphia territory, but Brady fumbled and DT Darwin Walker recovered at the 13. The Eagles had to punt after the resulting short possession, with Dirk Johnson getting off a 29-yard kick that allowed New England to start the next series at the Philadelphia 37. The Patriots took seven plays in driving to the tying score, with Brady completing all five of his passes. The last was to WR David Givens in the right corner of the end zone for a four-yard TD. The score was 7-7 at the half. In the third quarter, the Patriots advanced 69 yards in nine plays despite facing a heavy blitz. 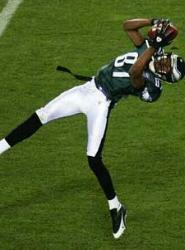 Deion Branch caught four passes along the way, the last for a 21-yard gain to the Philadelphia two. From there, Vrabel, used as a short-yardage pass receiver on offense, caught a touchdown pass to put New England back in front at 14-7. The teams again traded punts until the Eagles responded with a 74-yard drive in 10 plays - eight of them passes - that ended with McNabb firing a throw down the middle to Brian Westbrook for a 10-yard TD. As the period wound down and the contest entered the fourth quarter, the Patriots were methodically driving down the field against a tiring Eagles defense. RB Kevin Faulk had two catches on screen passes, the second for 14 yards to set up a two-yard Dillon scoring run that put the Patriots back in the lead. The Eagles had to punt following their next series and the Patriots again drove to a score. On second down, Brady (pictured below) threw to Branch for a 19-yard gain and a roughing the passer penalty on DT Corey Simon moved the ball to the Philadelphia 16. Two runs by Dillon advanced the ball to the four and, while the defense held, Adam Vinatieri kicked a 22-yard field goal to put New England up by ten points. 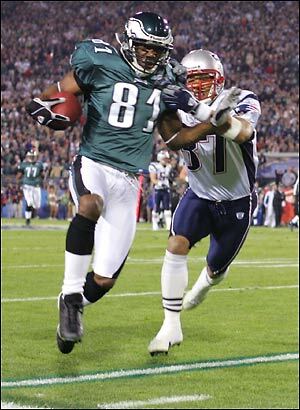 On the next Eagles possession, McNabb was intercepted by Tedy Bruschi, but the resulting New England series was a short one and Philadelphia got the ball back with 5:40 left to play. The Eagles showed a surprising lack of urgency on the next drive as they moved methodically down the field, huddling after each play and using up a great deal of time. McNabb completed eight passes during the 13-play series that covered 79 yards. He tossed a 30-yard touchdown pass to WR Greg Lewis, but there was just 1:48 remaining in the game. An onside kick was recovered by New England. Using all of their timeouts as the Patriots ran the ball three times and punted, the Eagles got the ball back at their four yard line with 46 seconds left. It was too much to overcome - Rodney Harrison’s second interception with nine seconds remaining on the clock clinched the 24-21 win for the Patriots. The Eagles gained the most yards (369 to 331) and had more first downs (24 to 21). However, the vast majority of those yards came through the air as they were only able to run for 45 yards on 17 carries against the New England defense. Philadelphia also turned the ball over four times, to one suffered by the Patriots, and McNabb was sacked on four occasions while the Eagles got to Brady twice. Deion Branch tied the Super Bowl record for pass receptions as he had 11 catches for 133 yards and was the game’s MVP. 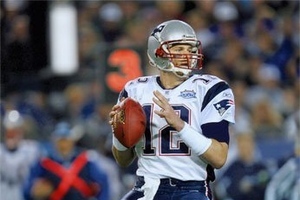 Tom Brady completed 23 of 33 passes for 236 yards with two touchdowns and none intercepted. Corey Dillon ran for 75 yards on 18 carries that included a TD. For the Eagles, Donovan McNabb was successful on 30 of 51 throws for 357 yards and three TDs but also tossed three interceptions. Terrell Owens (pictured below) caught 9 of those passes for 122 yards. Brian Westbrook had just 44 rushing yards on 15 attempts but also had 7 pass receptions for 60 yards and a TD. Todd Pinkston contributed four receptions for 82 yards. New England still topped the AFC East in 2005, although with a lesser 10-6 record as they endured the offseason loss of both offensive coordinator Charlie Weis and defensive coordinator Romeo Crennel, and had to deal with a spate of injuries during the regular season. The effort to win a third straight NFL title ended with a loss to the Denver Broncos in the Divisional playoff round. They would next return to the Super Bowl following the 2007 season. For Philadelphia, the Super Bowl defeat led to a difficult offseason in which several players became embroiled in contract squabbles – most notably Terrell Owens, who publicly questioned Donovan McNabb’s performance during the slow-moving fourth quarter drive. Owens returned to the club but was eventually suspended during the season, McNabb (pictured below) was lost in the 10th game, and the Eagles dropped to the bottom of the NFC East with a 6-10 record. They bounced back to win the division in ’06 – with Owens gone to Dallas and Jeff Garcia spelling an injured McNabb.